Beauchamp Foot and Nail Laser Clinic helps patients struggling with toenail fungus by offering a fast, safe, and effective toenail fungus laser treatment. Those suffering from toenail fungus can take advantage of the summer promotion of £100 off toenail fungus laser treatment, offered until 30 September, by scheduling an appointment for a free consultation. Toenail fungus is a common fungal infection that can often be painful, caused by pathogens that enter the skin through tiny cuts or separations between the nail and nail bed. The affected nails appear thickened and turn a yellow, light brown or cloudy color. The surrounding area can also become red and swollen. Beauchamp Foot and Nail Laser Center offers a toenail fungus laser treatment that is fast, doesn’t usually require a need for analgesia and doesn’t harm the nail or surrounding skin. The toenail fungus laser treatment works by shining a laser light beam through the toenail and vaporizing the pathogens causing the infection. The toenail fungus treatment usually consists of two 60 minute sessions about four to six months apart. 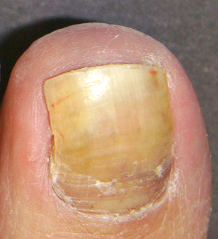 Improvement is seen as the toenail begins to grow out, and depends on the severity of the patient’s toenail fungus.